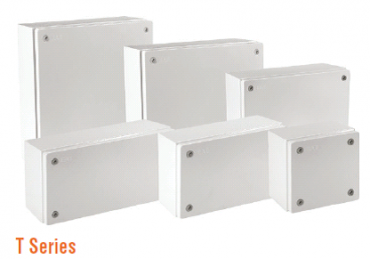 E-KABIN T Series Terminal Boxes For Electrical Housing Applications. – Epoxy polyester powder paint RAL 7035 60-80u. – Galavainised 1mm steel mounting plate. – M6 earth connection bolt on cover. – 120mm depth in size. 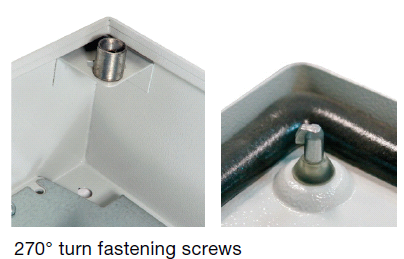 – 270 degrees turn fastening screws. – Wall mounting bracket included. 19ET2020 200H x 200W x 120D mm, mounting plate 188 x 188 x 77mm, 2.5kg. 19ET2030 200H x 300W x 120D mm, mounting plate 188 x 288 x 77mm, 3.2kg. 19ET2040 200H x 400W x 120D mm, mounting plate 188 x 388 x 77mm, 3.8kg. 19ET3030 300H x 300W x 120D mm, mounting plate 288 x 288 x 77mm, 4.3kg. 19ET3040 300H x 400W x 120D mm, mounting plate 288 x 388 x 77mm, 5.2kg. 19ET4040 400H x 400W x 120D mm, mounting plate 388 x 388 x 77mm, 6.6kg.